The official report in the Italian files is already posted at this link. This post brings together more detailed information. After its defensive victory over 22 Armoured Brigade at Bir el Gubi, Ariete Division remained in the area until 25 November, when it moved off east in pursuit of the supposedly beaten 8 Army. Preceding this however, Panzergruppe Afrika requested support for the encirclement of 7 Armoured Division at Sidi Rezegh. At the order of the Corpo Armata di Manovra, which controlled Ariete, a mobile force was detached to support the Afrikakorps in its fight against 7 Armoured Division. This post gives a timeline and order of battle for this column, which was named after its commander, Brigadier-General di Nisio, Deputy Commander of the Ariete Division. What is clear from this, the uncertainties notwithstanding, is that this was a well-balanced force of armour, artillery, and infantry. A very considerable step above the force balance the Empire troops were fielding at this time. 1300 Joins German column coming from North-East and receives orders to accompany this column from German commander (either Cruewell or Neumann-Silkow). German records give the time of contact as 12.35, at a point 12km north-east of Bir el Gubi. 1400 – 1900 Joins combat at Bir el Gubi. German records show that Ariete was supposed to start at 1400 together with 15. Panzerdivision, covering its right flank. The German attack started at 1500, Ariete reported being in combat at 1600 with enemy armour, which is confirmed by German after-action reports – a group of British tanks attacked from the left into the path of Ariete and the flank of 15. Panzer. The late start led to the flank of 15. Panzer to be uncovered, which caused severe problems to its advance. At the end of the fight The di Nisio column claims 153 POW, amongst whom 3 officers, and large quantities of materiel. Morning The column is ordered to rejoin the division which in turn is order to join the pursuit of the 8 Army. The column rests in place, awaiting the arrival of the division. It comes under artillery fire. Evening The column rejoins the division. 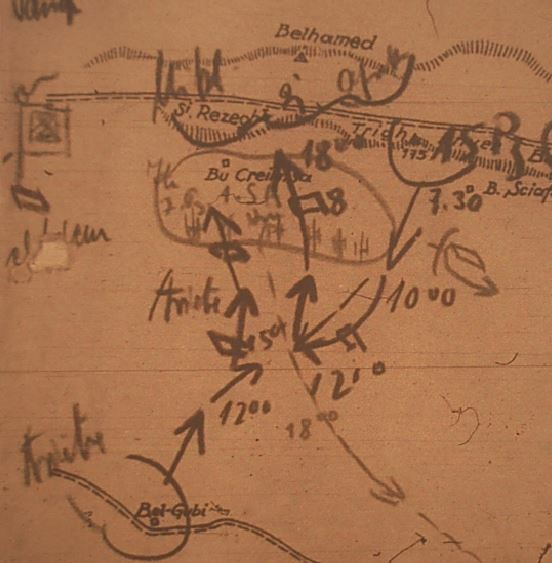 Map of the battle of Totensonntag from the Afrikakorps war diary. Lighter text and drawing showing Empire troop positions. Brigadier General Ismaele di Nisio had an interesting wartime career. Prior to the war, as Lieutenant-Colonel, he authored two training pamphlets, on tanks in combat and infantry patrols. Following his stint as deputy commander of Ariete, he may for a short time have taken over as acting commander, and then rose to command the armoured Young Fascist division (No. 136) during the Gazala battles and at El Alamein. On 8 September 1943, the day of Italy’s surrender, he commanded the 47th “Bari” Infantry Division in Sardinia. He remained a royalist and contined in active command of 9th Corps and the Puglia & Lucania Military District in southern Italy until the end of war. A Bersagliere in North Africa uniform with the typical feathered helmet. From the Italian Army website. This entry was posted in Content and tagged Ariete division, Italian Forces, Sidi Rezegh. Bookmark the permalink.